Must be time to continue my catalog of great cars at Beaulieu, England’s National Motor Museum. We’d left off with the vintage cars or cars produced between the wars. Next come the classics. Immediately after the Second World War, England was building a lot of small sports cars for export, to help boost their economy. I’m not sure the first car in my list falls into that category, however. 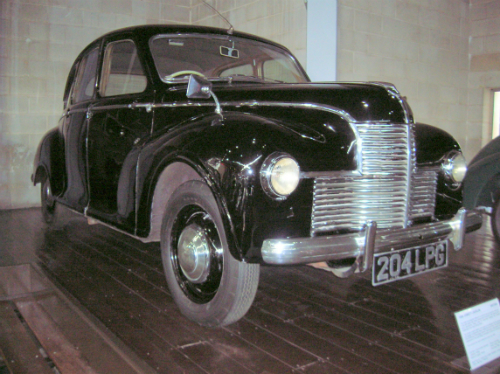 A check on Wikipedia shows the Javelin was only available as a saloon and, at 14 feet long, definitely doesn’t fall into the “sporty” category—the Jowett Jupiter on the other hand…. Appearances can be deceptive however, because the Javelin’s four-cylinder engine was capable of driving the car at 76 mph. More surprising still, it did well in rallies, picking up a first in class in the 1949 Monte Carlo Rally, and another at the 1952 International RAC Rally. 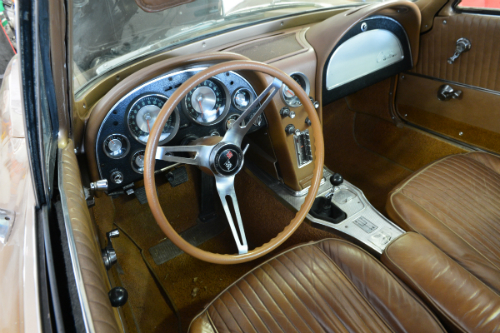 It was only built from 1947 to 1953, and only 23,000 or so were produced, making it a relatively rare car. The North American JowettRegister only knows of five or possibly six in North America and three of those are in Canada. While the Javelin looks old-fashioned now, it was considered quite modern at the time. Here’s another car to be featured at the Nocona, Texas, auction being held this weekend by the Vicari Auction Company. 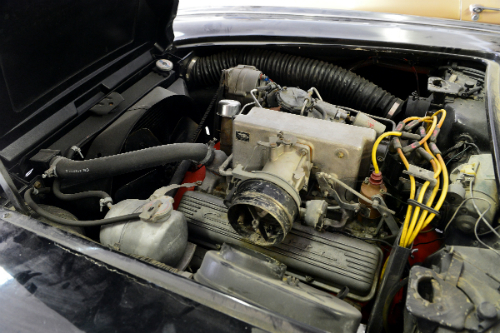 This two-door Tri-Power (three two-barrel carburetors) convertible not only has matching numbers, it still has its original engine, drivetrain, and paint. Not my favourite shade of red, but I’d still love to take a drive in it. 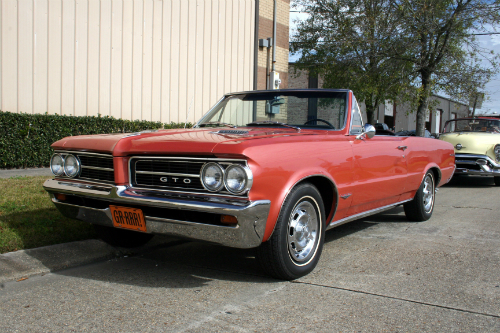 Possibly making it more collectible is the fact that 1964 was the first year the GTO was available as a convertible. For more details on the car, check out these photos or read its listing on the Vicari website. The Vicari Auction Company is planning its inaugural Texas auction, to be held in Nocona this weekend (April 19-20), in a big way. Not only will they be auctioning off 200 classic cars, they’re also holding a classic cruise and poker run. Details can be found on their website. Let’s look at the Corvettes. 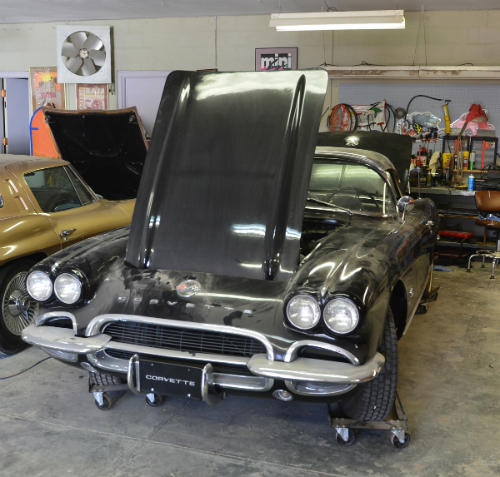 Vicari says both are extremely rare, mostly original, and have been stored in Texas by a collector since the 1980s. First up is this 1962 Fuelie Corvette, said to be one of only 254 “Big Brake” or regular production option 687 cars built that year. That was a racing option, and came with a four-speed manual transmission and a powerful 360 hp 327 V8 with fuel injection, and a 4.56:1 differential. It also included finned brake drums with their own cooling fans and attached air scoops, a fast steering adapter, and heavy duty shocks. Vicari says it was delivered in primer and that its first owner had it painted British Racing Green. Ergh. I like British Racing Green, but on a Corvette? Fortunately, the current owner repainted it black. 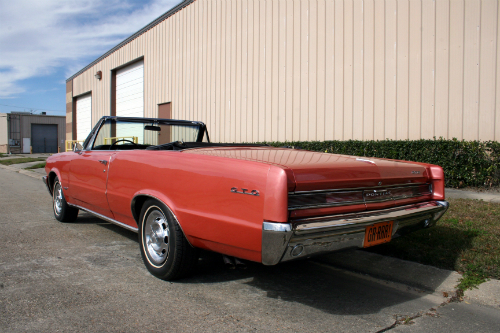 It’s well-documented, still has its original rag top, hard top, and transmission, and has less than 60,000 miles on it. 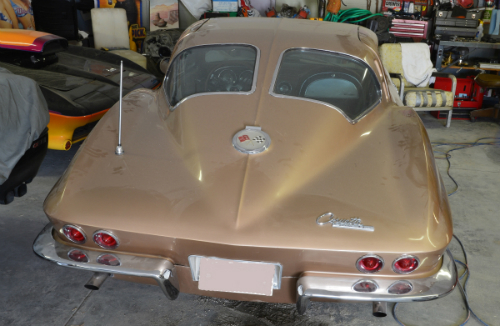 Next is the holy grail of Corvettes, a 1963 split window ZO6 coupe, one of only 199 built that year. It also has “Big Brakes,” combined with a 327 fuel-injected V8 and a four-speed manual transmission. 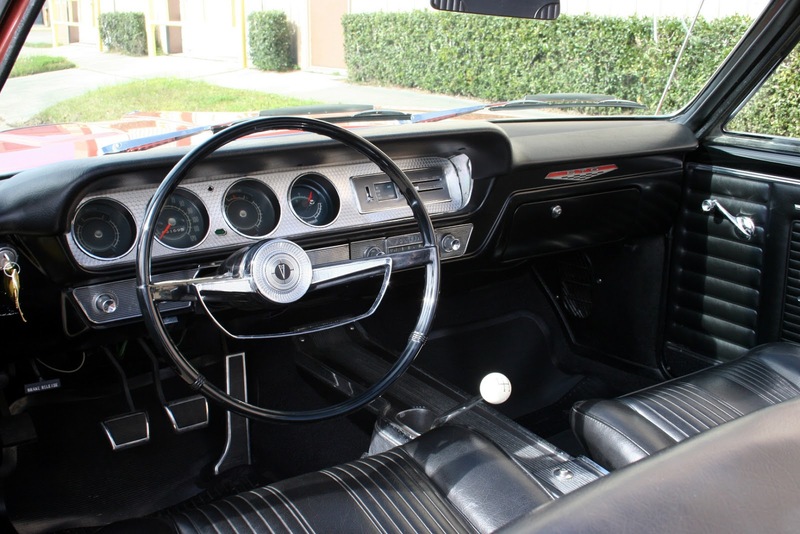 It still has its original black interior, but the exterior, in gold, has been repainted once. Mechanically, a different master cylinder is thought to be the only change made. 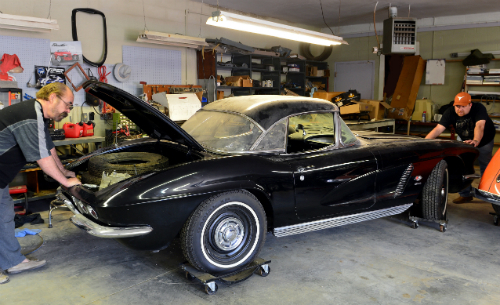 With only 38,000 miles on it, this Corvette is sure to tempt somebody. As part of their annual meeting in Las Vegas last month, the Sports Car Club of America (SCCA) inducted Carroll Shelby into their Hall of Fame. Given his track record, that’s not surprising. It’s just too bad it didn’t happen while he was still around to enjoy it. While he’s best known today for the Shelby Cobra, his involvement with the SCCA began as a driver. 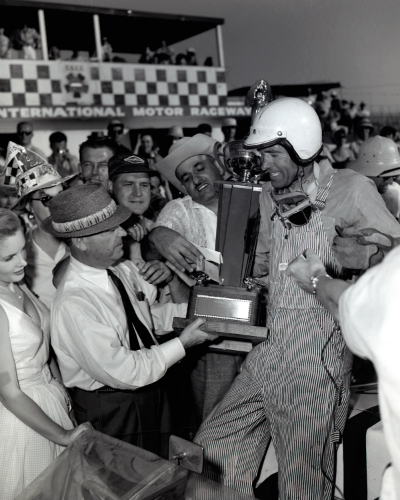 He joined the SCCA in 1952 and remained a member until he died last year. As an amateur, he won the 1956 SCCA National Championship in Formula Libre. As a professional, he took the 1959 24 Hours of Le Mans and participated in eight Formula One races. Shelby’s grandson Shawn Shelby accepted the honour for him. The SCCA website quotes him as saying, “He was never really that sentimental about cars – he was always looking for the newest thing. These cars that people now pay millions of dollars for, he would tear down in a second to build something better.” Sounds like a gearhead to me. Chanelle Sladics on Loveland Pass in Colorado. Gotta love this promotional video (SORRY, NO LONGER AVAILABLE) by McLaren Automotive for their new 12C Spider. They’ve put drift champion/hill climbing champion Rhys Millen behind the wheel, as he takes on professional snowboarder Chanelle Sladics on the snowy slopes of Colorado’s Loveland Pass. She can take the direct route, he has the faster vehicle. While the car was debuted at last year’s Pebble Beach Concours d’Elegance, it is just being delivered now. Like its predecessor, the 12C, the Spider comes with a carbon MonoCell chassis. It also sports a retractable hard top (you can see it in action in the video). 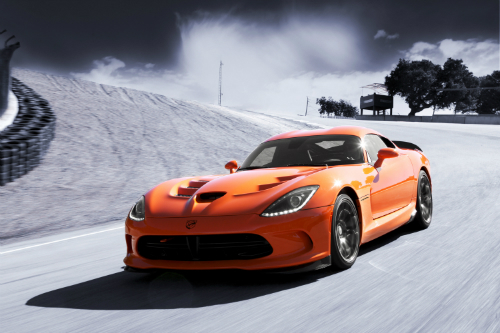 Theres a 3.8 litre VI twin turbo under the hood, mated to a seven-speed SSG dual-clutch transmission. Both the 12C and 12C Spider come with a “winter” powertrain setting—I’m assuming that was used making the video. McLaren has nine US dealers, plus one in Toronto. If you have a spare $300,000 (base MSRP for the US is given as $265,750), you might want to contact them to order your very own Spider. 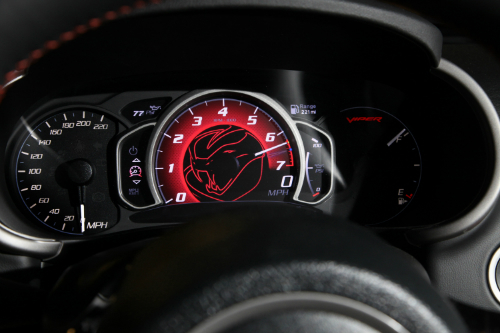 If you were lucky enough to be able to attend the New York International Auto Show last month (nope, I’m not that lucky), you probably saw the 2014 SRT Viper TA (for Time Attack). 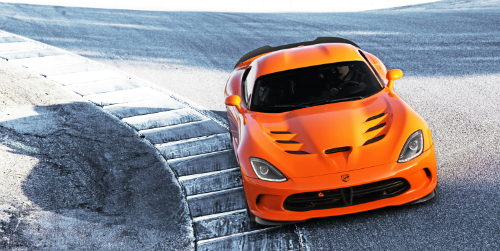 If not, here are some photos of Chrysler’s extreme performance package for the Viper. Only 33 will be built in the “TA Orange” paint colour. I think we’re talking about a seriously collectable vehicle. Not to mention seriously driveable. 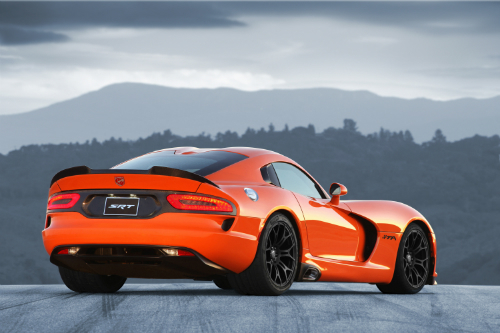 Chrysler says the TA package is designed to get the most out of the Viper, which already has an “ultralow center of gravity, 50/50 weight distribution and largest contact patch in the production car world.” Add Sidewinder II wheels clad in Pirelli P Zero Corsa tires, Brembo brakes, and a two-mode Bilstein DampTronic suspension. Combine with a carbon fibre brace, shock dampers, and road racing derived stabilizer bars, and a curb weight of only 3,348 pounds (estimated). All this powered by an 8.4 litre V-10 with 600 lb.-ft. of torque. Naturally, it comes with racing seats. Definitely track ready, but it’s also street legal. I’ve already reserved a spot for it in my virtual garage. Here’s the last of the vintage or “between the wars” cars that caught my attention on my visit to Beaulieu. First we have a 1935 Auburn 851 speedster. According to the museum’s list of vehicles, it’s not currently on display, so I was lucky to see it. The plaque beside it says that like all Auburns it was tested to ensure it would exceed 100 mph. It’s noted to belong to the Montagu Collection, so I wonder if this was one of the current Earl’s father’s cars that formed the core of the collection. 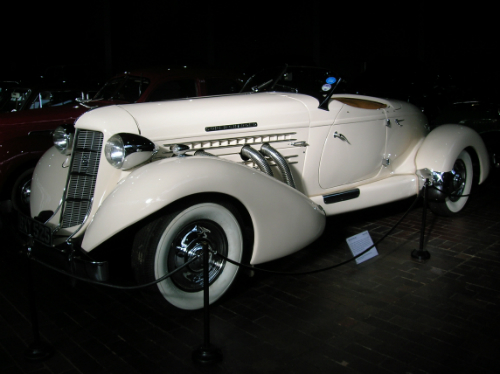 The plaque also says that this car may have appeared with Marlene Dietrich in the 1936 film Desire (the film also stars Gary Cooper as an auto mechanic who stops her from trying to fix the engine with a hammer). It’s a stunner, isn’t it? Whether or not it’s the same car, you can see photos of the car from Desire on the Internet Movie Cars Database. 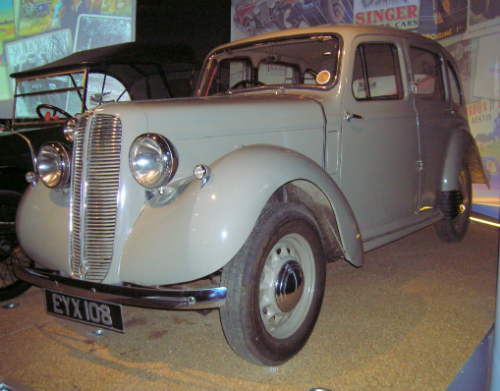 Finally, we have a 1938 Hillman Minx “Magnificent,” a popular British saloon car (Britspeak for sedan). “Magnificent” seems a bit of an overstatement for what looks like a very ordinary car, but the Minx was a successful marque for Hillman, who made them right up to 1967 (Wikipedia). According to Wikipedia, Hillman was part of the Rootes Group, perhaps better known for the Sunbeam Tiger. 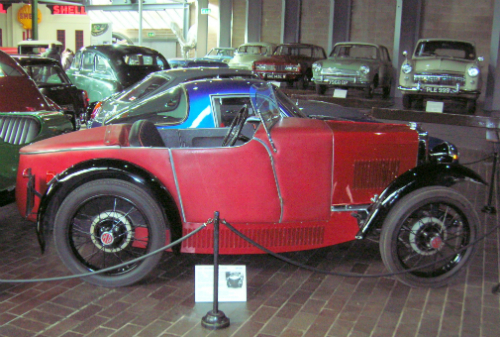 I’d already discussed the 1930s Bentley Blower in my post on Beaulieu’s Ian Fleming connection, so it’s on to the 1930 MG M type, otherwise known as the Midget. Wikipedia gives a detailed explanation of the 56 year history of the MG (for Morris Garages) marque. In brief, the company was founded some time in the 1920s (the exact date seems to be in dispute) by Cecil Kimber, an employee of William Morris. 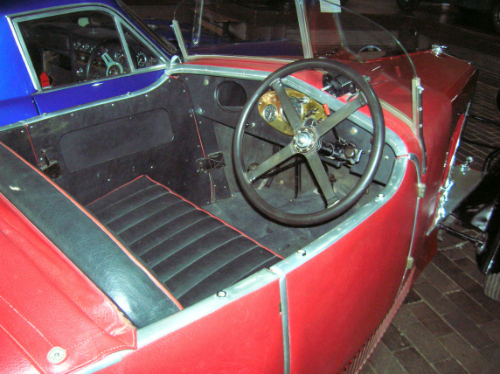 While the company did produce some saloons, they’re of course best known for their long line of two-seater sports cars of which the M type, with its boat-tail, was the first. 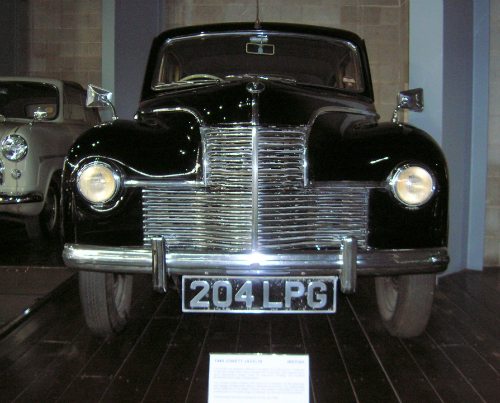 The museum’s website describes it as “basically a hotted up version of…the Morris Minor.” The fabric body (not unusual at the time) kept it light, helping performance. Not surprisingly, these cars were raced. 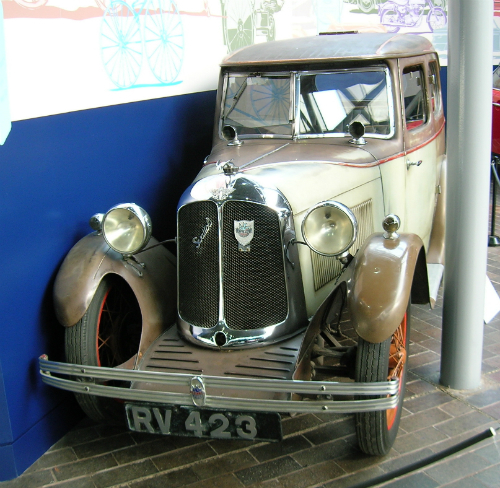 Not a lot of civilian vehicles were built during the two world wars, but the history of motoring at the National Motor Museum in Beaulieu, UK, continues with its collection of vintage cars, those built between World War I and World War II. I only have photos of six, while there are 20 listed on the Museum’s trust site. While I may have missed a couple or not been able to get photos due to their positioning, not everything the Museum owns is on display at any given time. Trust me, I would have noticed the 1927 Morgan Aero-Sports! Today, I’ll be covering a pair of Austins, a company I’m partial to as my parents owned a series of them when I was a kid. Not as old as these, however. First up is a 1923 Austin Seven Tourer. 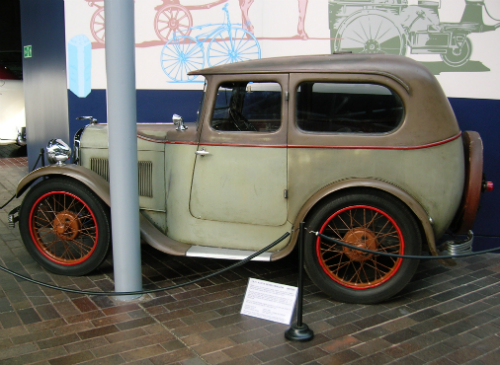 According to the plaque beside it at the museum, the Austin Seven or “baby” Austin was originally produced in 1922 by the Austin Motor Co. Ltd., and became quite popular as it had features until then generally only found in larger cars, but was priced like the small car it was. Little things like brakes on all four wheels. There’s a 747 cc, 4-cylinder engine under its hood, giving it a top speed of 50 mph. Original price? £165. Note the badge on the hood; a similar badge is sported by today’s MINI, even though the company has changed hands many times since then. Next is a 1931 Austin Seven Swallow. I felt sorry for it, wedged in between a post and a wall, but better than not being on display at all. Like the earlier Austin Seven Tourer, it had a 747 cc, 4-cylinder engine, and was still priced at £165. 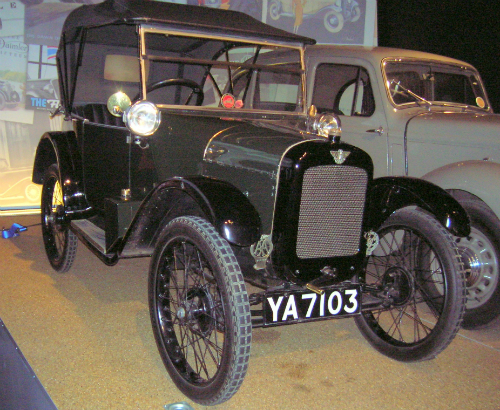 According to the Museum’s website, this particular model was the “last known two-seater made by the Swallow company.” Wikipedia says Swallow, founded by designer William Lyons and William Walmsley, had originally built sidecars for motorcycles, later expanding into coachwork for cars, with the Austin Seven being their first. Eventually they started building their own cars, first called SS, and renamed for obvious reasons after the Second World War to Jaguar. The history of British car companies is indeed convoluted. In addition to these two beauties, the museum also has a 1928 Austin Clifton 12/4, and another Austin Seven Tourer, also from 1928.